· Special brackets are brackets which are completely treated as external tags. To add items, enter a tag name in the text box below the list and click the Add button. To remove items, select one item in the list and click the Remove button. 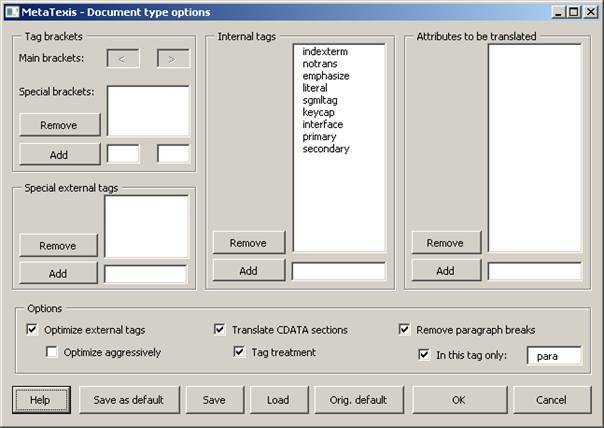 In the Special external tags frame, you can define tags which need special treatment. To add items, enter a tag name in the text box below the list and click the Add button. To remove items, select one item in the list and click the Remove button. In the Internal tags frame, all tags are defined which are treated as internal tags. To add items, enter a tag name in the text box below the list and click the Add button. To remove items, select one item in the list and click the Remove button. · Activate Optimize aggressively when all internal tags which have external tags as neighbors should be treated as external tags (disregarding any closing tags) (recommended only in special circumstances).